I showed my sister a photo as inspiration for a witch door hanging I wanted to make and asked her to pick up a few of the supplies on her way to visit for the weekend. Not long into the project, my mom decided she HAD to have one as well. Supplies: 16" Styrofoam wreath, assorted ribbon, cable ties, Styrofoam cone, hot glue gun, hot glue sticks, 3 bamboo skewers, black fabric, poly-fill, cinnamon broom or sticks from the yard, duct tape, clippers, strand of 50 purple lights. Start by gathering 4-6 loops of ribbon, cut the end and secure at the base with a cable tie. 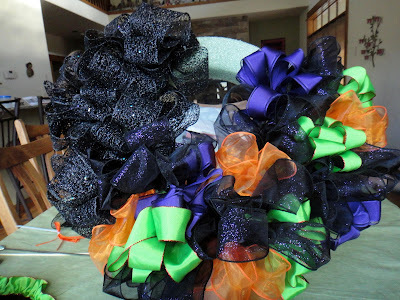 You'll need to make 30-40 ribbon clusters. 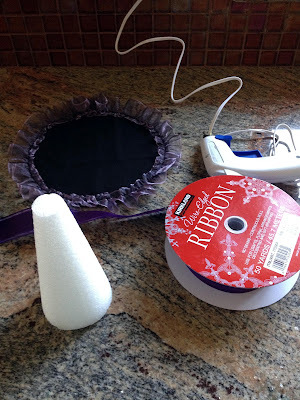 Insert the end of the cable tie into the Styrofoam wreath and pull through. The bottom half of the wreath will be the witch's dress, so choose colors you want for the dress. I went with royal purple satin, sheer lavender, sheer black with purple glitter and silver. 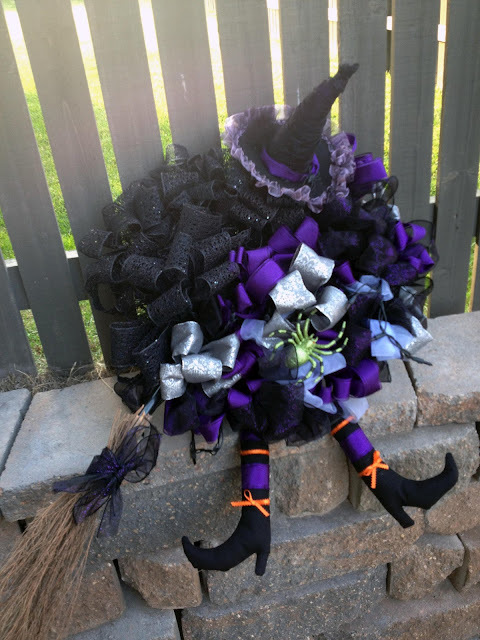 My mom wanted more color, so we worked sheer orange, green satin, royal purple satin and the sheer black with purple glitter into her witch's dress. 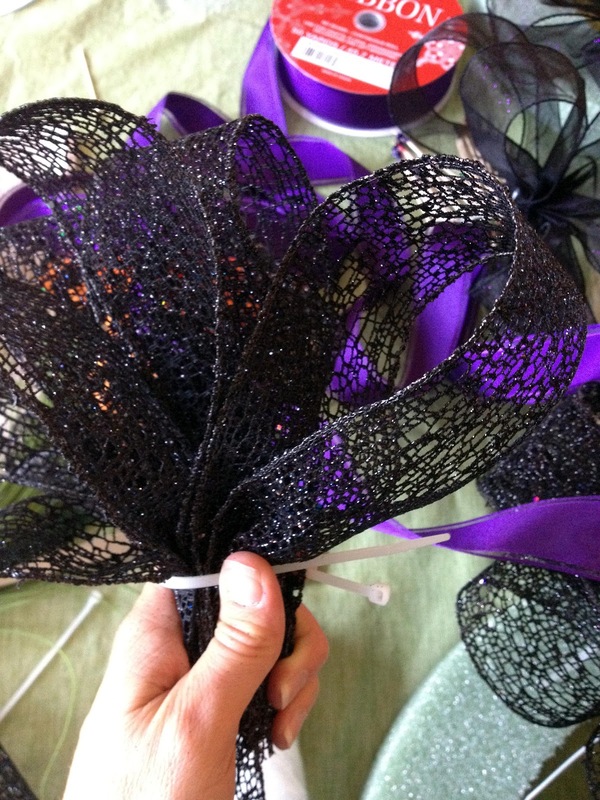 For the witch's hair, we used a wide web-like black glittery ribbon. Ribbon can be so expensive, but Costco sells seasonal ribbon $7.50 for 50 yards. Keep filling in with the ribbon clusters until the Styrofoam is covered (makes sure to fill in the sides). You can either leave the center empty for more of a witch wreath look, or fill in the center (by inserting the cable tie only an inch or so instead of pulling all the way through) so the witch's dress is nice and full. Leave a space at the top right for the witch's hat. 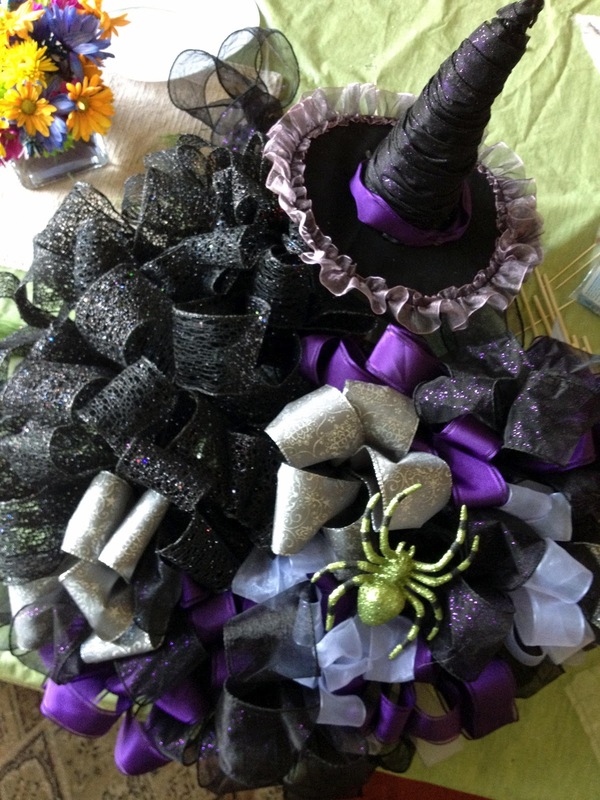 For the hats, my mom went upstairs to her sewing room and got to work on the brim of the witch's hat using a stiff fabric she uses at the bottom of the purses she makes. 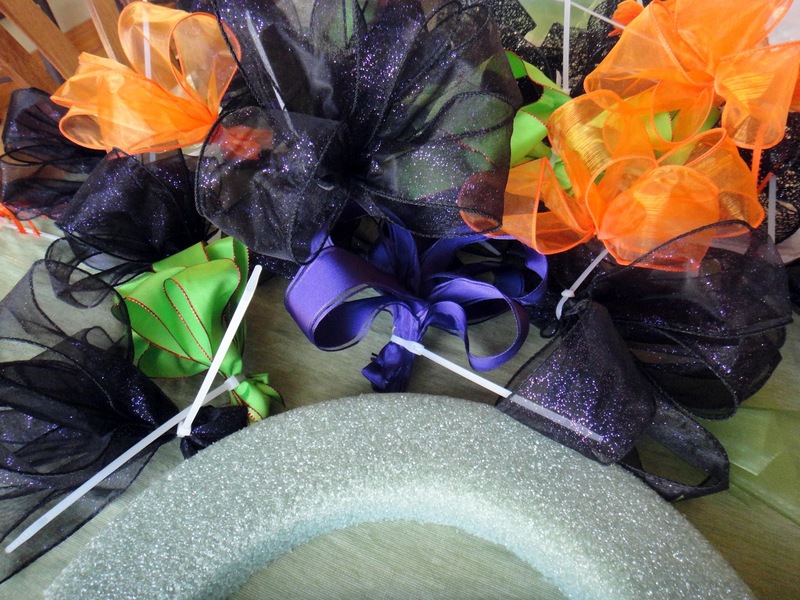 She trimmed with a sheer purple ribbon for two of the hats and the satin green for the 3rd hat. I gathered the sheer black ribbon with purple glitter, securing to the top of the cone with a dab of hot glue and wrapping all the way to base and securing with another dab of hot glue. After hot gluing the Styrofoam cone to the brim of the hat, I pierced the two together with a bamboo skewer and inserted into the Styrofoam wreath secured with hot glue on both ends into the wreath. Fill in around the hat with ribbon clusters and then trim the excess cable ties and skewer with clippers. My mom sewed the witch's legs and boots and added ribbon for the stockings. We filled the witch's legs with poly-fill. The other two bamboo skewers were used to insert the legs into the Styrofoam. A thin line of hot glue at the top of the stocking holds the stocking to the skewer. Insert into the Styrofoam and secure with hot glue at the entry point. I kind of like the witch's legs up in the air drying. Looks like she landed upside down. I strung a set of 50 purple lights through the witch's dress. 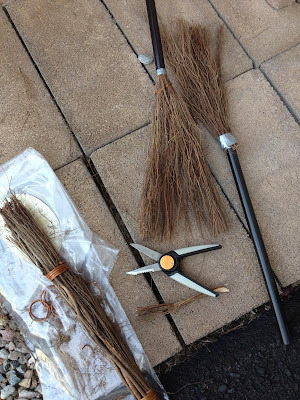 For the brooms, I bought one of those cinnamon broom sticks that appear in the front of the grocery store this time of year and chopped it up to make two brooms. My mom bought a cheap devil staff for the handle and we cut it in 3rds for all three wreaths. I secured the cinnamon broom to the handle with a narrow strip of duct tape and covered it with ribbon. A couple of days later, I found the perfect glittery brooms in the dollar section of Target. Oh well. I like the cinnamon smell. Both are cute as can be and there are many others out there if you search Halloween poly deco mesh wreath. I had my own version in mind using ribbon and I love how it turned out. 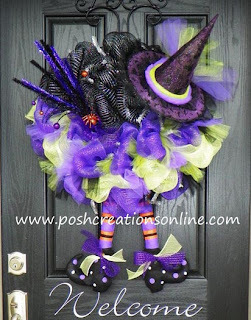 We made all three of our witch door hangings for right around $50. My favorite part of this project was making these with my mom and sister. 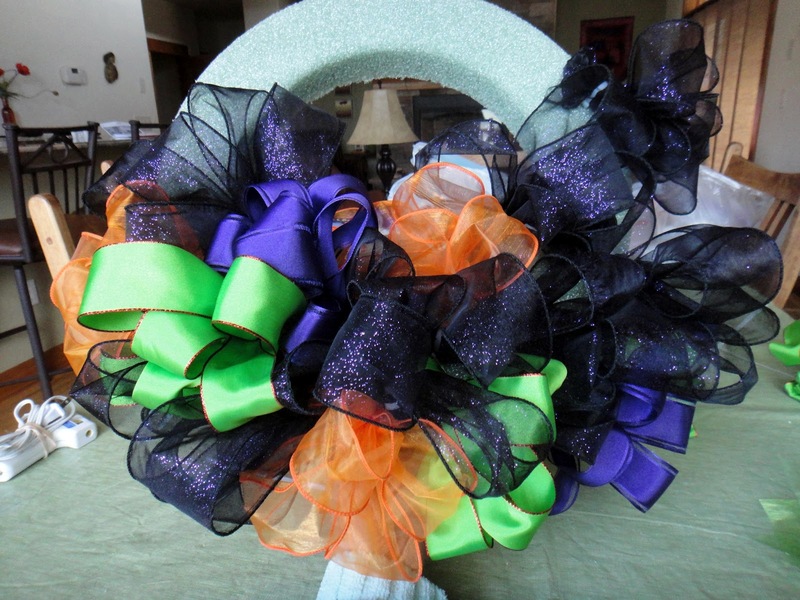 My sister may have called herself craft challenged, but we all had good ideas on how to pull the witch wreath together while our daughters rehearsed a musical performance in the basement...just like we did at their age! This looks like something you would see at an expensive boutique!! Beautiful project and so cute/festive :) I am pinning! I love these, and the price is great. I've had friends make some wrapping that deco mesh around a wire frame and paying $50 for supplies just to make one of them. I need to check out Costco! Thanks for sharing this tutorial! 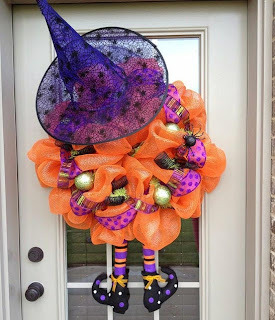 Your witchy wreath looks awesome! I love it! Definitely pin worthy! Wow, these are super cute and so original. I love them!